U.S. Sen. Richard Blumenthal outside the Hamden Stop & Shop with a striking worker. Top elected officials headed to Stop & Shop Friday — not to buy groceries, but to support workers who succeeded in closing supermarket business in the second day of a strike. Across the region, nearly 31,000 employees walked off on Thursday afternoon. The workers’ union had been in negotiations with the supermarket chain since Jan. 14, but talks have stalled primarily over proposed cuts to medical and pension plans and different work rules for new hires. 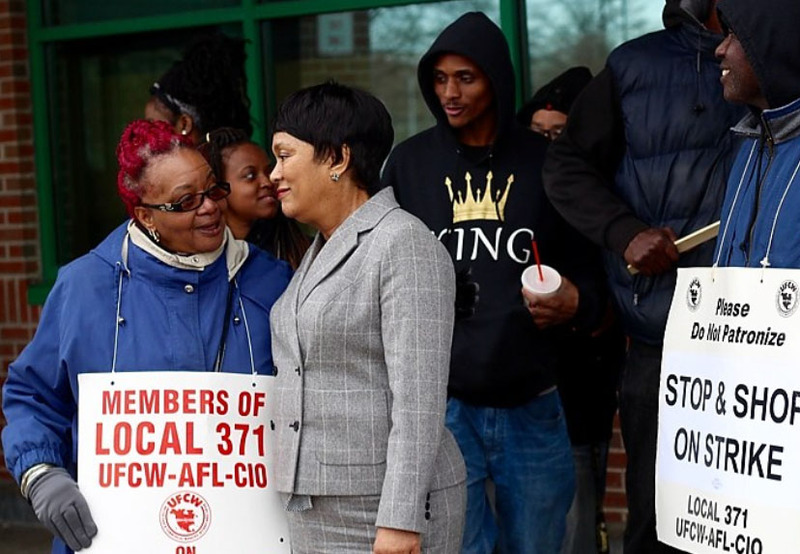 On Friday afternoon, New Haven Mayor Toni Harp swung by the Whalley Avenue grocery store in New Haven to show her “solidarity” with Stop & Shop employees, her “friends and neighbors” who’d gone on strike. Just a few miles away up Dixwell Avenue, Lt. Gov. Susan Bysiewicz and U.S. Sen. Richard Blumenthal joined striking Stop & Shop employees on their own picket line in Hamden. All three politicians pledged their support for the striking workers, and called on the grocery store corporation to return to the negotiating table and cut its workers a fairer deal. 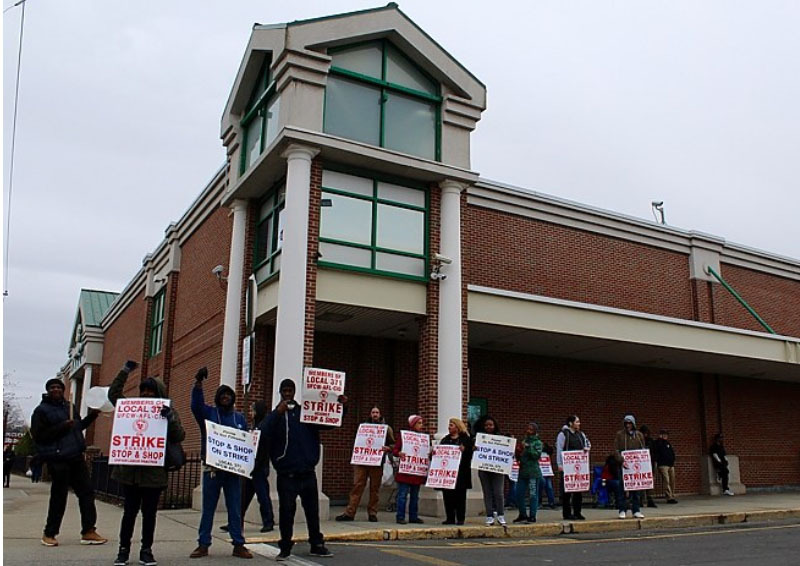 In New Haven, the picketers from United Food and Commercial Workers Locals 371 and 919 had been holding the line near the store’s parking lot for a full 24 hours, with two guys who work the night shift even keeping watch until morning. Although the extent of store operations throughout the region varied from store to store, the New Haven walk-out had shut the supermarket down. A manager and a security guard stood at the front of the store, keeping customers away from the empty shelves and registers. A handful of people still walked in for the People’s United Bank, which remains open. Outside, the workers held up signs, beat a drum and chanted, “We want a contract!” Drivers heading down Whalley Avenue honked in support. The picketers had even convinced two delivery trucks to turn around. Teamsters from Frito-Lays and Guida’s Dairy made calls, snapped pictures and then turned their trucks around. Only one truck driver, from C&S Wholesale Grocers, crossed the picket line. Around 1:30 p.m. on Friday, Harp arrived. She chatted with the shop stewards, then she walked down the picket line, shaking hands with the strikers. Harp said she will be writing a letter to Shop & Stop in support of the strikers. She said she’d also ask city employees and department heads not to use Shop & Shop until a contract is signed, suggesting that they can go to Elm City Market or Edge of the Woods Market instead. It said the deal would include pay raises for all workers , would increase the company’s pension fund contribution and would not change Sunday time-and-a-half premiums for full-time workers nor change the healthcare plan’s deductibles. Meanwhile, up in Hamden, Bysiewicz and Blumenthal paid their own visit to the Dixwell Avenue Stop & Shop to voice their support for the workers and call for continued negotiations. Bysiewicz told the crowd that she and Gov. Ned Lamont had already written a letter to the leadership of Stop & Shop that morning, urging the company to come back to the negotiating table. She said that just before arriving at the strike in Hamden, she had spoken with Stop & Shop President Mark McGowan, who told her that in his 28 years with the company, there had never been a strike. “I asked him if he would step up and personally go to the negotiating table,” she told the crowd. “The UFCW supported both Lamont and I when we were running and now it’s our turn to support them,” Bysiewicz told the Independent. Next, Blumenthal stepped forward to speak. “You heard that number. $2 billion? 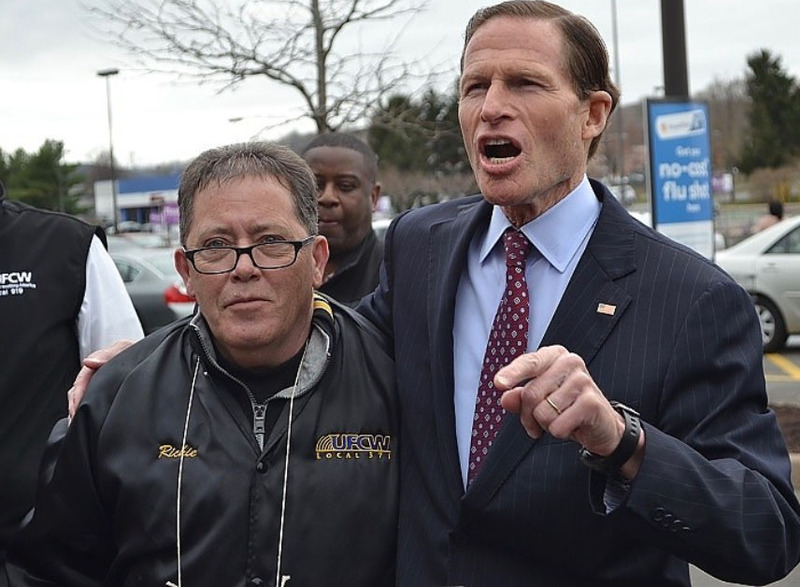 Not going into your pocket,” Blumenthal told the striking workers. It was a reference to a union assertion that Stop & Shop parent company Ahold Delhaize had more than $2 billion in profits last year. “That’s right,” shouted back someone in the crowd. The Whalley Avenue Stop & Shop in New Haven. Connecticut’s whole federal delegation, he said, stands with the workers. “And I can pledge to you, I am not going to cross any picket lines,” he said. Lisa Tarbelle, a 23-year Stop & Shop employee who works in the store’s deli, held a sign listing the workers’ demands. She said it’s a high-pressure job, and that the store has been short-staffed recently, putting greater strain on the employees already there. The state’s largest healthcare workers’ union warned Friday that as many as 2,500 employees at 20 nursing homes could be on the brink of a strike by the end of next week. Uber and Lyft drivers are closer to taking home a larger share of each ride’s pay thanks to a favorable committee vote in Hartford last week.